The all weather change robe, featuring the essential Chunky YKK(R) Zip front, external pockets, large internal storage pocket AND MP3 player pocket!, shower proof, wind proof. The Warmest change robe on the planet! Dryrobe(R) The outdoor change robe. A weather-proof change robe. Get changed inside it! Ideal for changing sports clothing or wetsuits outdoors. Dryrobe(R) has a waterproof & windproof exterior nylon fabric & a lining that dries you & keeps you warm, Soft lined external pockets, large internal storage pocket & MP3 player pocket. Our Unique chunky YKK(R) Zip front is an essential element providing fast, easy exit & entry. , Cold-weather conditions present unique challenges. Preserve your energy & core temperature with full-body protection from the elements. Leave it on over your clothing or wetsuit & re-use multiple times throughout the day without the dryrobe ever feeling wet or cold. 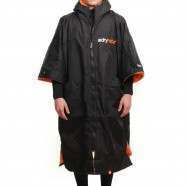 Get dry, cover up & stay warm with Dryrobe(R) , ADULT Size : Length : 1.2m long from shoulder body change space 84cm wide, The Adult size suits 51ft up to 63ft , Features, Waterproof outer shell, 100% Waterproof & windproof outer shell fabric. One piece body construction with no shoulder seams. Super warm lining, When conventional toweling gets wet it takes an age to dry and feels wet against your skin, throw in some wind chill and youll know all about it. Dryrobe Lining is a synthetic Lambswool which draws the water away from your skin, drying you instantly while insulating you and making you feel unbelievably warm. Full length 2 way reversible YKK(R) zip, You can operate the zip from inside the robe, while changing, or from the outside, as normal. This is an essential element in the design so as to allow fast easy entry & exit. , Sealed seams. All the seams on the dry robe advance are sealed. this, along with the minimal seam design ensure the best protection possible from the elements. External, soft lined, pockets, The dry robe advance has deep soft lined pockets to keep your hands warm & store your stuff in too. Internal poacher pocket, A huge A4 size internal soft lined pocket for storing underwear, clothing or thermal base layers. Internal zip entry iPod, MP3 / wallet pocket, The inside chest pocket can safely store your valuable items and zip the sealed in a 2 way waterproof pockets. cant get wet from the outside or from the inside (if you are wet or in a wetsuit). Super light construction, The lightweight materials used & design ensure that the dryrobe advance is surprisingly light. At only 1.3kg It can be packed down small into a compression sac, or carried anywhere easily.